Malmö is growing and developing. This is to the benefit of CMP. 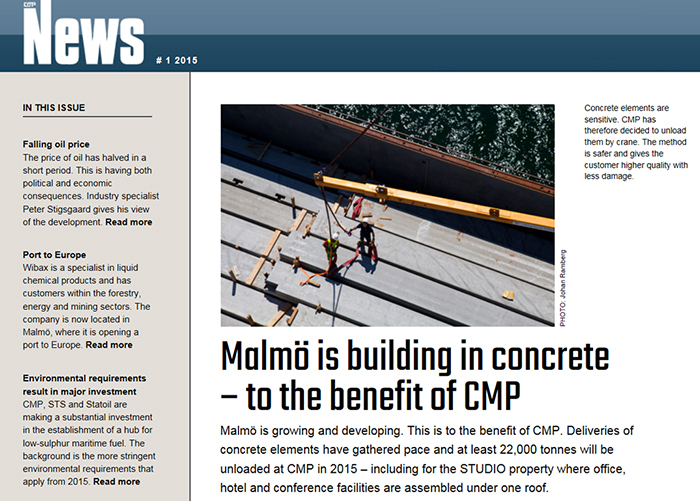 Deliveries of concrete elements have gathered pace and at least 22,000 tonnes will be unloaded at CMP in 2015 – including for the STUDIO property where office, hotel and conference facilities are assembled under one roof. The prefabricated concrete elements are engineered and produced in Latvia via the UPB company and installed in walls, roofs and floors etc. They are brought by ship to Malmö and then reloaded onto lorries for onward transport to building sites. One of the major elements, which CMP will be handling during 2015. “We receive deliveries from UPB every seven weeks throughout the year. These elements are used in the office, hotel and conference property that is under construction in central Malmö. It is called STUDIO and will be completed in autumn 2016”, says Björn Larsson, terminal manager at CMP. UPB and CMP have collaborated in similar projects before, most recently three years ago when about 24,000 tonnes were shipped in via Malmö. “Three factors are central for us in the collaboration with CMP – flexibility, speed and the port’s geographic location”, he continues. “In the projects we have implemented together so far, security of supply has been excellent, despite the intensive pace. This has paved the way for new collaborations, the supplies to STUDIO for example”. Prefabricated concrete elements are sensitive. CMP has consequently selected an unusual solution for the volumes that will be unloaded during 2015. It is usually done using a crane, but Björn Larsson and his colleagues are instead having a container truck do the job. “With a crane there is a greater risk of the prefabricated element being damaged, particularly if a wind is blowing and the goods start to spin round”, he explains. “The method we have selected is both safer and gives the customer higher quality with less damage”. As mentioned, security of supply is important when UPB chooses collaborative partners. Each ship carries about 2,500 tonnes of concrete elements which CMP will discharge. The entire logistics chain has to function to ensure that the right element is delivered at the right time, otherwise there can be delays at the building sites. STUDIO is not the only project to which CMP is delivering concrete elements in 2015. Another example is the eXlent Hyllie office block. It is located in Malmö’s new district of Hyllie, with Kastrup airport only twelve minutes away by commuted train. eXlent Hyllie is due for completion in Spring 2016. “Here it involves slightly lower volumes for our part, approximately 6,000 tonnes which also come from UPB in Latvia”, says Björn Larsson. “At the same time several interesting construction projects are underway in the immediate surroundings. We are therefore hoping that it will be possible for our operations handling concrete elements to expand even further during 2015”.